It’s 6:03 am and I am curled up in a big fluffy blanket. A cup of coffee is in my hand, though it’s not really needed. I am wide awake and ridiculously excited for the day’s upcoming shenanigans. I’m devoting all of my digging time to the beloved Oxblood Lily. 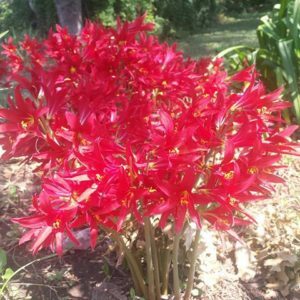 The Oxblood Lily is the flower bulb that first stole my heart. I couldn’t believe the color….such a deep, vivid red. The Oxblood blooms out of nowhere….It was magical. Oxblood Lilies fall into a category of “rare heirloom bulbs”, though my collection boasts upwards of thousnands upon thousands of bulbs. I have salvaged, saved, rescued and relocated Oxbloods from despicable and uninhabitable growing conditions for over 25 years. I have gone to abandoned, delapitated houses that ghosts wouldn’t even visit. I have met many charming gardeners on the “other side of the track”, as I look for old homesteads. I have hopped fences, jumped over ‘No Trespassing’ signs, and talked to men in bulldozers, getting permission to dig before lots are destroyed……..all for the sake of a bulb. It’s not just a bulb though. It’s an Heirloom Bulb. An Oxblood Lily. A miracle of nature. A bulb among bulbs.An incredible gift to the human species. Obviously, I really, REALLY like Oxblood Lilies. In fact, I’ve never turned down a chance to dig an Oxblood Lily. As Anna Pavord once said “A garden can never have too many flower bulbs.” If there is an Oxblood in the way if danger, I’m your girl for the rescue. Happy Oxblood Lily kind of Gardening Day, my friends!